It serves us well to think “outside the box” as this can lead to different perspectives, forced creativity, and can open doors that you never knew existed; I constantly do this when it comes to cooking. Now, what if I were to think “inside out”? Hmmm. Well, I did just that and it led me to create this week’s recipe! 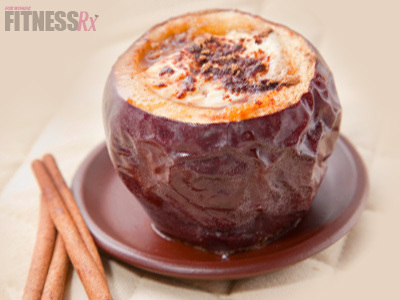 Introducing to you…Inside-Out Baked Apple “Pie”! This dessert is so incredibly delicious, so healthy, so simple, and so darn pretty to look at you will hesitate taking a bite (OK who am I kidding, you’ll devour it after just one taste!) The hot, tender apple surrounds a combination of cinnamon, egg whites, oats, and coconut flour to form a perfect center crust. This dish is worth sharing with your family and friends! 2. Boil a pot of water (to be used later to fill the bottom of the baking dish). 4. In a small bowl, combine oats, flour, baking powder, cinnamon, Stevia and salt. Mix well. Add egg whites and vanilla to the mixture and stir well. Set aside. 5. Place apples upright in a baking pan. 6. Evenly scoop half of the filling mixture into each of the apples. Top each with 1 tsp. of coconut oil. 7. Add boiling water to the baking pan until there is approximately 1/4 inch of water in the pan. 8. Bake for 40 minutes, or until tender and golden brown. Remove from the oven and let sit approximately 10 minutes before serving. Enjoy! Editor’s Note: If you have any specific requests or would like to share your feedback on the above recipe, please e-mail Allison Frahn at AliFrahn@yahoo.com.